The genesis of the Great Falls, Virginia, Hash stems from John Gurr’s run with the San José, Costa Rica, Hash while on a business trip there in May 1982. 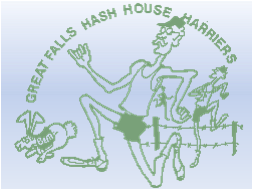 Peculiarly smitten with the concept of Hashing on the basis of that single run, Gurr convened a meeting of several local runners upon his return to Great Falls and proposed the formation of a local Hash chapter. Attending that meeting at Gurr’s home were Jay Rini, Bob Clark and Bob Ozols. Clark volunteered to host the first run and it was held at his house on June 23, 1982. Participants in the first run were Bob Clark, Bob Ozols, Mike Murphy, Duncan Ritchie, John Gurr, Kathy Walsh and Doug Greco. The second run was held at Gurr’s house on the succeeding Wednesday, June 30, 1982, and saw the first appearance of some of our club’s real stalwarts – namely Bob Vickers, Mike Gillette and Gerry Dargis. Rae Huffstutler joined in on the third run, John Quale on the fourth, Lanny James on the fourteenth, Bob Neilson on the fifteenth, Frances Soges on the nineteenth, Bob Raymond on the twenty-fifth, and Bob Kenner on the twenty-eighth. Since then, fortunately, the quality of our membership has improved considerably. Bob Clark organized the design and purchase of our first T-shirt, which was distributed in late 1982. Bob described what Hash running was all about to an artist friend who drew up our now-traditional logo, featuring several gangling Hashers navigating precariously across fields and over barbed-wire fences in pursuit of a rabbit wearing a waistcoat labeled “beer.” There is an uncanny, but perhaps understandable, resemblance between Bob Clark and the lead runner in the pack depicted in our logo. We celebrated our 50th run (and our first anniversary) at the Gurrs’ home on June 22, 1983. That was the first occasion at which families were invited and a post-run picnic featured. A second T-shirt edition was brought out a few weeks thereafter to memorialize the event. Our 100th run was celebrated in a truly elaborate style at the Gillettes’ estate on June 3, 1984. Families were again invited, a keg of beer was tapped, chicken was grilled en masse, a one-mile “fun run” was organized for those unwilling to participate in the gut-busting 75-minute course laid by hares Ritchie and James (names that will live in infamy), and a refreshing post-run splash in Gillette’s neighborhood lake was enjoyed by a sweaty mob. Gerry “Durable” Dargis was picked by acclamation as our first Grand Master at the 101st run on June 10, 1984. “Durable” Dargis was our first member to complete 100 runs. We commemorated the event in October 1984 by presenting him with a “Retired Hash Horn” mounted on a varnished board and accompanied by an explanatory engraved plate. 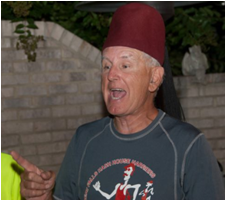 Beginning with our second member to complete 100 runs, Duncan “Radar” Ritchie, we began the tradition of engraving the name, newly-designated Hash nickname and the run date on a silver cup that is given to a member who completes 100 runs. The cup is retained by that member until another member attains the honor. In December 1985, Mike “Ole Fud” Gillette became the first Great Falls Hasher to make the pilgrimage to Kuala Lumpur and run with the Mother Hash. Dave “Barbed Wire” Maloney duplicated the feat in February 1986. Maloney brought back pictures proving he’d been there; Gillette told great stories. On March 1, 1986, our Hash reached a major milestone when Oleta Hamilton became our first female Hasher to complete 100 runs. She was christened with the nickname “First Lady” and received an autographed picture, courtesy of Tom “Conan” Quinn and other Secret Service-types in our Hash, from someone who signed the photo, “From one First Lady to another, Nancy Reagan.” The hoopla died down after a few days and the banners proclaiming “Oleta’s 100th!” were removed from River Bend. 1,000 runs each, or something like. Ole Fud is pretending to be Rrocks Starr. The 500th run was held on October 5, 1991, at the Great Falls Hunt Club. On June 21, 1992, GFHHH celebrated its tenth anniversary. The 1,000th run was held on November 11, 2001, and the 25th Anniversary run was on June 17, 2007. The 1,500th run was an A-to-B in November 2010, and the 30th Anniversary run was once again at the Gillettes’, in June 2012. We average around 25-40 participants – running, walking or just chatting – each week, with a typical run taking from 50 to 90 minutes (ugh!). The libations , food and fun flow with gusto! Respect, admiration and affection for the Mufti increases geometrically, as well it should. [Huh? – the Mufti] A good mix of the ancient and the young, the quick and the not-so-quick, keeps the group steady and loose, ready for even more fun. And everyone always marks the checks!